Stampin' Up has had 48 colors of ink and paper for as long as long as I can remember. While the color "families" they've had seemed to work, there were MANY colors I never EVAH used. Well...Stampin' Up has spent the last 3 years doing some research and focus groups and decided to mix it all up and do a complete COLOR RENOVATION. Literally--a complete renovation! 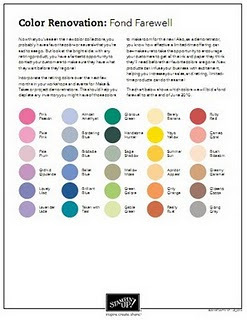 Of the current 48 colors, 25 of them will be retired the end of June 2010. The new catalog, which debuts July 1, will have 40 colors....some of the original 48, some returning In Colors and 5 brand new colors added. Stampin' Up will still have In Colors each year, but each collection will now linger for 2 years instead of only one!! SQUEEEEE!!! 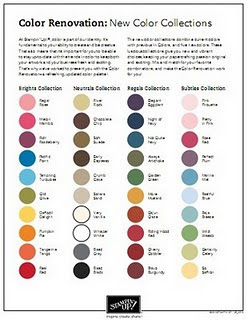 There are 25 current colors that are retiring...but Stampin' Up did a lot of research and determined these are the least popular of the current 48 colors. Obviously this was a general concensus, because there are a few colors I thought "WHA???!! They're retiring THAT?!" But overall I am excited about the Renovation and looking forward to reorganzing my stamp studio with the new colors! So...wanna see what all the excitement is about?!!? I plan to offer the retired cardstock and ink as goodies to my current club members--I'll be putting together packets of paper and ink and will offer packets of paper for sale as well. I'll post here on my blog to let you know when I'll have my big sale before the new catalog comes out, too!! I'm off to San Diego this weekend...my brother is graduating from college with his Bachelor's of Science in Business and Marketing! I'm so excited for him! I'm really looking forward to celebrating with him all weekend....now to make him a card...!! !